Italian yard Ferretti Group has launched its latest superyacht, the Custom Line 120, which was built at the yard's La Spezia facility for an American owner. 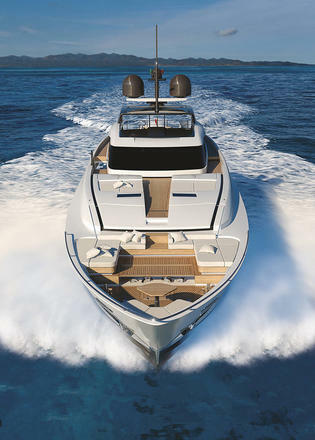 This 38.36 metre yacht features a semi-displacement GRP hull, while interior and exterior styling comes courtesy of Francesco Paszkowski — a first for the Custom Line range. 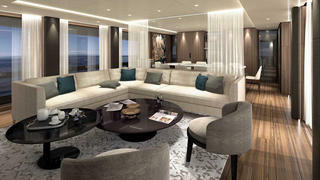 The Italian yard revealed that hull number one will be based in the Bahamas. 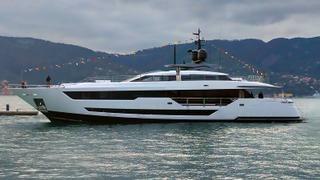 Hull number two is already under construction and work on the third Custom Line 120 will begin in La Spezia in January. 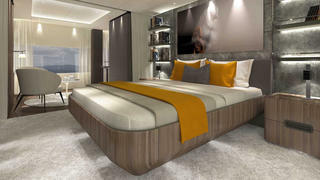 Accommodation on board the Custom Line 120 is for ten guests split between a main-deck master cabin, complete with his and hers en-suites, two twin cabins and two VIP cabins, which feature double beds facing the windows for better views out to sea. Four crew cabins allow for a staff of up to seven people while transom garage and foredeck locker allow for three tenders to be stored on board. The two-piece slanted patio door opens on hydraulic struts to give access to the main-deck saloon, which features an L-shaped sofa facing aft, while the formal dining area includes enough room for all ten guests to enjoy a meal together. The upper deck and the shaded skylounge features a retractable bimini, sunloungers, cocktail bar, al fresco dining options and a superyacht spa pool. Power comes from a pair of 2,638hp MTU 16V 2000 M94 engines for a top speed of 25 knots and a maximum cruising range of 1,050 nautical miles at 11 knots. Zero-speed stabilisers ensure a peaceful night’s sleep at anchor. 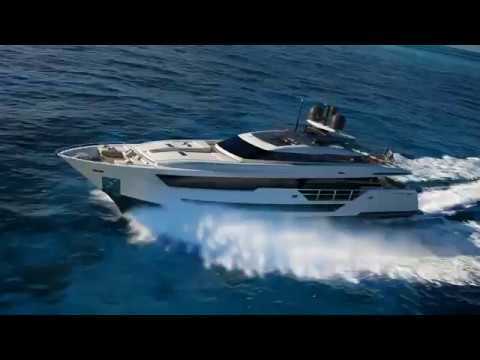 Other superyacht projects currently under development at the Ferretti Group's numerous yards include the first 28.6 metre Riva 90 yacht, which is due to hit the water in Sarnico next summer.